2015 Save Bray Studios face book page! Hammer Film Productions founded in 1948 quickly acquired a following with such films as The Quatermass Experiment (Val Guest 1954) and the follow-ups, Quatermass II (Val Guest 1956) and X the Unknown (Leslie Norman 1955). Later it found a niche in classic horror, Frankenstein & Dracula movies and then prehistoric spectacles like One Million years BC ( Don Chaffey 1970). But Hammer were responsible for more than just horror flicks ! The Dammed (Joseph Losey 1960), Witchfinder General (Michael Reeves 1967) among a host of others, including films from Vernon Sewell, John Gilling, and Don Sharp. Freddie Francis (also responsible for directing some of Hammer's horrors) became one of our most respected cinematographers (Elephant Man, Cape Fear, and The Straight Story (1999)). Early films were shot on a Vinten Everest, then from 1957 onwards most were shot in 'scope on an Arri 35mm. In 1959 Hammer acquired a Newall NC, a British made version of the American Mitchell rack-over NC developed in the late 1940s. The Newall has four 1000' mags, a studio (3-phase) motor, a 24v motor, and a 240v single fps animation motor. Hammer mainly used it for reverse, stop frame, high speed or wild (non sync) exterior shots, where they couldn't use the 3-phase mains Arri. (see The Damned 1961, Quatermass and the pit 1967). Hammer used the Newall for model and effects work right up to the early 70s, then with the demise of Hammer as a production company the camera, like most of their assets, went under the hammer at an auction held at Bray Studios. The pictures show it as it is today, with the original motors, standard Cooke Panchro lenses and Edmonton dolly. It is unusual that a camera of this age is still original and complete, with none of the after market camera conversions that usually happen to cameras as film technology advances. It is still used occasionally for model animation work and exhibition. Cooke deepfield Panchro 100mm f2.5 (sn 302649) c.1948 Hammer's old lenses get a new lease of life on a Panasonic GH1.. Thanks to Don Fearney (Hammer archivist), and DPs Freddie Francis and Harry Oakes for their assistance in compiling the cameras history. The Mitchell News Camera or NC was introduced in 1930, the blimped version, BNC, was the camera of choice for major motion picture production from just before the beginning of World War II through to the advent of the Mitchell BNCR in December 1967. The first was made in August of 1934, the second in August, 1935, and third in January 1937. Because of the war, there was only one camera made between 1939 and 1946, (serial no 18, in June of 1941). After the war production by Mitchell Camera Corp. increased dramatically and by 1947 they were making 32 a year, (serial nos 32 through 64). The age of Hollywood in the 1950s' was about to roll and a Mitchell BNC was still the camera of choice, but Mitchell were unable to satisfy world demand and for several years a copy was made under licence by Newall Engineering Ltd. in Peterborough, England. The Newall NC's were built with noticeably different looking film mags, that were both heavier and quieter than the American models, more suited to film sets than newsreel or military uses, they use an elegant quick release mechanism on the mag door, rather than the Mitchell screw action which sometimes needed a hammer to get it off. Mitchell manufactured 364 BNCs, (#1-365, there is no #13), many over 60 years old, were still the work horse of the animation industry (until the advent of DSLR's) and to some extent the motion control industry. They were renowned for the precision and accuracy of the film transport mechanism -better than that of many modern cameras. A reflex version, BNCR, was relatively briefly produced (#107 appeared on e-bay in 2007) before being superceded by the last Mitchell, the S35R. 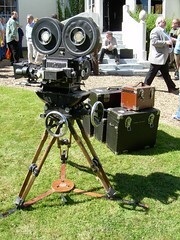 The design was then acquired by Panavision for their range of cameras. There are no available figures for the number of Newall NC made, but s/n 521 (with a Panavision mount) sold at Christies in 2006.
part of the GB-Kalee brochure around 1946. click on image to enlarge. Madeline Smith, behind the camera! I think it was Harry Oaks who said the camera was just used for special effects, and this angle was given credence by Leigh Took (Mattes and Miniatures @ Bray) who leant me the old wooden legs and the sidefinder for the event.... It also explains why Hammer owned the camera, a drama shoot might be done and over in 3 or 4 weeks (my estimate, don't actually have figures for Hammer... ) and it makes sense to hire a camera if this is all you are doing. The special effects take longer, require the camera to sit around unused... and maybe it's helpful if it is the same camera every time... it becomes a known quantity in terms of it's capability and foibles, and it can be modified. Typical of this vintage Cooke, the 100mm lenses has no follow focus ring. The 50mm has the front machined off, such that the focus distances have had to be re-engraved, it is likely this was to facilitate use with an anamorphic adapter? It is the bottom lens on the photo with Maddy; the 100mm lens is closest to the motor, to the fore of the photo. However the camera clearly wasn't just used for mattes and stop-frame sfx, because of the motors. The 3 phase mains motor were used for sound sync (1950s/60s sound recorders used 3 phase mains too!) and the 12v motor is on the camera in the behind-the-scenes photo for "The Dammed". It's also true that a Newall Blimp (for sound proofing the camera) was stored in the cellars at Bray Studios for many years after the Hammer auction, and this may have been part of the Hammer kit. Unfortunately, several Thames floods over the years took their toll and it no longer exists (the distinctive Newall badge from the mag cover was salvaged.. see below). What bothered me for a while was that the lenses were standard spherical lenses (for shooting 3x4).. but Hammer films are anamorphic... Hammer's version of wide screen involved a separate anamorphic lens in front of the standard lens (similar to the first Cinemascope lenses), with it's own set of focus adjustments (sounds like a nightmare). I did see another photo on the day, with another Newall, blimped and with a serial number clearly visible! but it was 200 and something... I think the photo was taken at Elstree. So not all bts photos (inc cameras) will be of this Newall... which includes I guess, the picture with Barbara Shelley (although it appears to be the same, or similar, Edmonton dolly she is sat on.... may have to, sadly, update the web page!). This was not the 1st Hammer reunion at Bray, the 1st was in 1999, see Dark Terrors magazine issue17. The House of Horror: Memories of Bray.